There is an old saying that states, “there are three kinds of lies: lies, damned lies, and statistics.” Those that watched the first Presidential debate were presented with a whole lot of the first two items and a fair amount of misuse of the last. It’s best to make yourself as informed as possible before entering the voting booth, but if you’re armed with campaign rhetoric and ideals from advertisements, you’re likely to be disappointed over the next four years. While we can’t always keep our politicians honest, it’s getting easier to check their statements for factual information with the help of some excellent apps. These mobile political lie detectors are invaluable weapons in the fight against falsehoods and manipulated data. Between pretty much any program that you watch between now and election day will be nothing bot a string of politically charged ads. These pieces of propaganda are sure to fill your head with promises of what one party will do for you while explaining exactly why the opposing party will fail to do the same. With the influx of cash from Super PACs, thanks in part to the case of Citizens United Vs. Federal Election Commission, it’s hard to keep track of where political ads come from. Super PAC App will tell you who put out a particular ad, how much money that PAC has raised, how much they spent, and how much truth is in the message. Though WP Politics is a heavyweight in the political news apps, it’s also one of the finest resources for fact checking thanks to its integrated Twitter feature called The Forum. In this particular partition of the app is a list of Tweeters known as the Fact Checkers. This is a place to keep your eyes during the debates, as feeds from the finest fact checkers in the business are converged onto one screen and deliver updates live. If something sounds fishy coming out of a candidate’s mouth, these guys will sound the alarm immediately. Similar to Super PAC App, Ad Hawk is built to tell you exactly who is behind the mudslinging and monumental promises made in political ads. Hold your mobile device up to your TV and let Ad Hawk catch wind of the strategically woven words that come with these ads. The app will identify the ad in question and inform you of who brought it to air. From there, you can do further research on the people responsible for the particular propaganda from within the app. Perhaps the coolest part of this app is it shows how much an organization has spent on positive spin toward one side and negative toward another. It becomes increasingly clear what organizations exist to better their candidates odds and which are essentially smear campaigns. One of the worst parts of the political cycle is the water cooler conversations that go along with it. People from both sides of the aisle often resort to repeating talking points like parrots for their party’s agenda. What’s worse is those talking points are often based on half truths or outright lies. If a person busts out a ‘fact’ that you think is less than factual, then take it to the ultimate judge: Settle It! 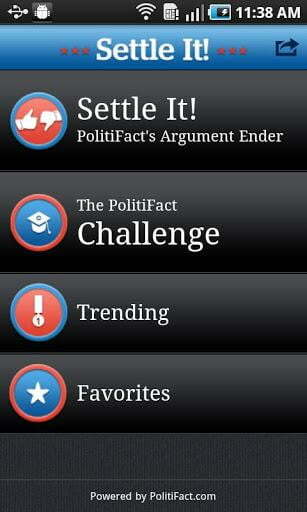 This free app from the folks at Politifact gives you the quick and dirty answer on the most hotly debated beliefs. It’s a great tool to have to shut down that friend or family member that gets their information from chain emails and partisan blogs. During the political season, it’s likely that some dirt gets dug and skeletons are retrieved from deep in a candidate’s closet. Unfortunately, there are also often statements and beliefs brought back into the limelight that have been dismissed, debunked, and debriefed long ago. Using its patented Truth-O-Meter, the Politifact Mobile app brings the fact checking organization’s entire history of truth-finding and lie-stopping to your phone or tablet. Check on the promises of the candidates, the overall honesty of elected officials on the Truth Index, and even see which way the wind is blowing with the Flip-O-Meter. 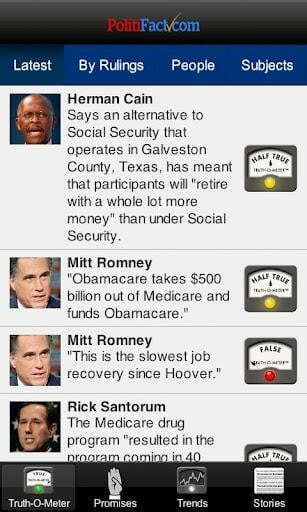 It’s a great way to keep candidates honest — even on statements they thought no one would remember.